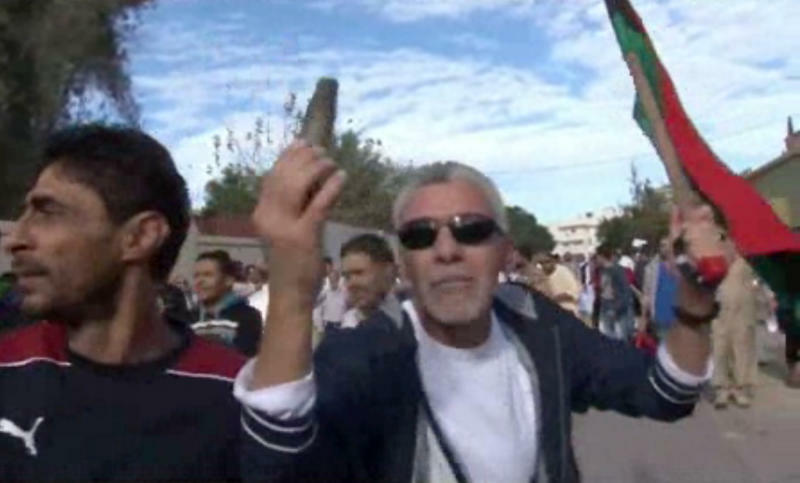 TRIPOLI, Libya (AP) — Libyan protesters again took to the streets of Tripoli on Tuesday, repeating their call for the country's recalcitrant militias to leave the capital after a militia attack on a similar protest killed 47 and wounded more than 500 last week. Meanwhile, lawmakers of the country's interim parliament questioned embattled Prime Minister Ali Zidan over the violence and pressed the government to take action against the militias. Some called for dismissing him and his Cabinet with a no-confidence vote and forming a new, crisis government. The army deployed troops to the capital on Monday, in what was the first show of state control there since the overthrow of Libyan dictator Moammar Gadhafi in 2011. However, disgruntled militias accused the government of packing the force with former pro-Gadhafi fighters, describing the deployment as a "coup." Residents have given the troops a warm reception, ululating, clapping and flashing V-for-victory signs in support. Some marchers Tuesday chanted: "Libya is not (war) booty." During the rally, protesters distributed sweets to policemen who arrived to protect the demonstration. Tripoli University spokesman Mahmoud Fathallah told the official news agency that the university is on strike until Thursday in protest against the militias. The rest of the city has not fully ended a strike that began just after Friday's killings. During and after the war, thousands of rebels who fought Gadhafi formed "brigades" which the new government later used to fill a security vacuum until the national army and police could be rebuilt. Over time however, the units turned into militias, expanding in power and size and putting pressure on the fledgling government and parliament. Tuesday's protest was the latest show of public outrage against armed groups since Friday's deadly shootings, which happened outside the headquarters of a militia from the western city of Misrata. It had deployed to Tripoli to battle Gadhafi's forces but later took over residential areas, villas and camps. Since the killings, some militias from outside Tripoli have left the city under public pressure. On Monday, Zidan flew to Misrata for talks with city council officials and militia commanders, according to privately owned al-Nabaa TV. There were unconfirmed reports he was forced out of the meeting after disgruntled militiamen gathered outside the building. Misrata militias and other militias in Tripoli accuse rival political and armed groups of orchestrating the demonstrations and firing at the protesters to turn public opinion against them. They describe the army troops that swept into the capital on Monday as remnants of Gadhafi's forces and denounce the move as "coup" against the revolution. Adel al-Tarhouni, leader of a militia umbrella group Zidan accuses of involvement in his abduction last month, told The Associated Press that Gadhafi loyalists were trying to take over the capital and that the coming days will be "decisive," anticipating more violence ahead. His group, called The Revolutionaries Operation Room, is loosely affiliated with the Defense Ministry. "These troops that were deployed are Gadhafi's brigades but under the independence flag," he said by telephone, referring to Libya's tricolor post-Gadhafi flag. He accused a parliamentary bloc led by former rebel Prime Minister Mahmoud Jibril of sending the troops to take over the capital. Tripoli-based lawyer and former government official al-Saghir al-Maghri described the accusations as "ridiculous." He said the Defense Ministry had made it clear that the troops moved into Tripoli worked for the government and had been trained inside and outside Libya over the past months. He said that militias from Misrata but also other cities like Gharyan were not withdrawing from the capital but only relocating, moving to inside camps run by the Chief of Staff. He expects more protests at the new locations.